Yes, it’s no coincidence that the founders of Facebook are of the Millennial/Gen Y generation and that their most loyal followers are largely the same. However, that’s now expanding, and it’s more of a sign of things to come than a fad (unless they sell out like MySpace). So it may be worth taking the time to understand how it can benefit your community, build better places. It can… tremendously. Even if Facebook eventually goes away, social networking is only going to grow. – Attendees at conferences consistently say that the most valued parts were the networking in the halls and the public Q&A after presentations. – People spend a significant amount of time watching publicly broadcast interview shows, from daytime to late night. – People choose where to spend money based on publicly posted peer reviews (ie Amazon, Yelp!, iTunes, eBay) rather than those of ‘experts’. The point is, buzz happens around interesting conversations, like when you feel compelled to spontaneously join a conversation, “I couldn’t help but overhear, but…” When those conversations are public, you’re actually encouraged to participate, and that’s when we benefit from a diversity of dialogue. Over time, there is trust built among those in conversation, which leads to dialogue + time = action. So to answer the question, Facebook is a medium that facilitates such public conversations, whether they’re a result of dialogue initiated face-face (the most effective by far), at a conference, on a show, etc. However, the difference is that these public conversations are among people you chose to trust, whether they’re the friends in your network or people you share a passion with in a Group or Fan Page, shortening the time needed for action. Thus, to use Facebook as a tool to help beautiful places like these outdoor cafe scenes come to fruition, start a Group or Fan Page and start talking about it. In fact, CreativesDC, a social network of creatives in Washington DC, has found Facebook to be their most effective tool by far in terms of getting people to meet and converse about building great places in DC, such as promoting this public event on March 31, 2009. 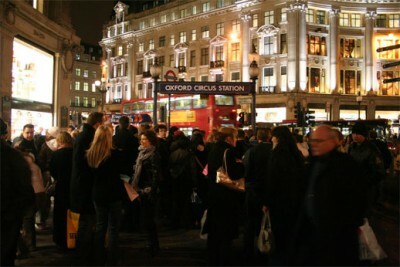 Photo of Oxford Circus, London by nickjeffery. Our project Renew Newcastle — in Newcastle, Australia — began life as a facebook group. Before we ever had a meeting, or an organisation, or a group we went to facebook to see if we could find people who were interested in supporting a scheme to revive the CBD through small scale, and temporary arts and cultural activity. Within a day we had 100 people, within a week or two we had a thousand, and now we have over 2000 people in the group. Newcastle, the city where the project is based is only a few hundred thousand people — so that is a very signicant proportion of the community. The group was critical in starting a dialogue, demonstrating support and nurturing the idea from half arsed scheme to execution with no budget or money to throw at PR or communication. I doubt we could have done it without it. What do you attribute the phenomenal growth to, especially 1000 people within a couple of weeks? I will say it’s a lot more exciting when there are real abandoned buildings for people to crowdsource, especially if they’re clustered in a natural cultural district. That’s what happened in the Temple Bar district in Dublin, Ireland, which was originally going to be razed. It was a combination of factors. The first one hundred or so were my friends. From there social networks can become self perpetuating very quickly as people forward links and get others to join. It helps to have good connections and a reasonably high profile in the local community (i started a major arts festival in the city and have gone on to write and present some short TV series on Australian TV) but the numbers involved were really the product of the way the recommendation system on facebook can quickly accelerate interest. I would also say that it was probably the right idea at the right time. The city has been in a slow decline for two decades and it has become increasingly apparent. People — particularly the “facebook generation” — have become increasingly frustrated with the quality of debate and solutions being offered. A positive and practical vision in that context (which is what i hope we are offering) has been very appealing in an environment where the city is lost in long running and polarising debates about its future. But i might not be the best person to ask! We’ve been trying to reinvigorate a natural cultural district in St. Louis based around Cherokee Street. We had a street wide open house last weekend where businesses threw events like sales, live music, grand openings, demonstrations, etc. and vacant spaces were open to the public. We bought ads in local entertainment papers, the community radio station, and hung posters around town, but by far the number 1 reason people came out was because they heard about it on Facebook. Getting something forwarded or seeing that a friend is attending an event is the best word of mouth. The event was a big success, thanks in no small part to beautiful weather and Facebook.